Now this is how out of it I am... I didn't even realize it is my blog anniversary! Someone had to comment and tell me and I even have a count down thingy to remind me. In honor of the anniversary, I will redirect you to the first review I wrote. Jeremy Fink and the Meaning of Life by Wendy Mass. After returning from vacation and finding 422! posts in my Google Reader, I sifted through and picked out some of my favorite blogs to read. 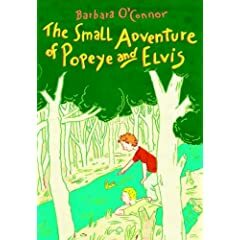 I hope I am not too late to present to you a book trailer for Barbara O'Connor's new book, The Small Adventure of Popeye and Elvis. Humor me and watch it again if you have seen it already, if not... What are you waiting for??? Now who is with me? Get on over there to Amazon and pre-order your copy. Ya know ya want to!